Chris Olave caught a pass in the very first game he ever played in. It came in the season opener against Oregon State last year and went for five yards. He then went the next eight games with just one more reception. When Austin Mack was lost for the season at Purdue, Terry McLaurin moved over to Mack’s X receiver spot and helped out Binjimen Victor. 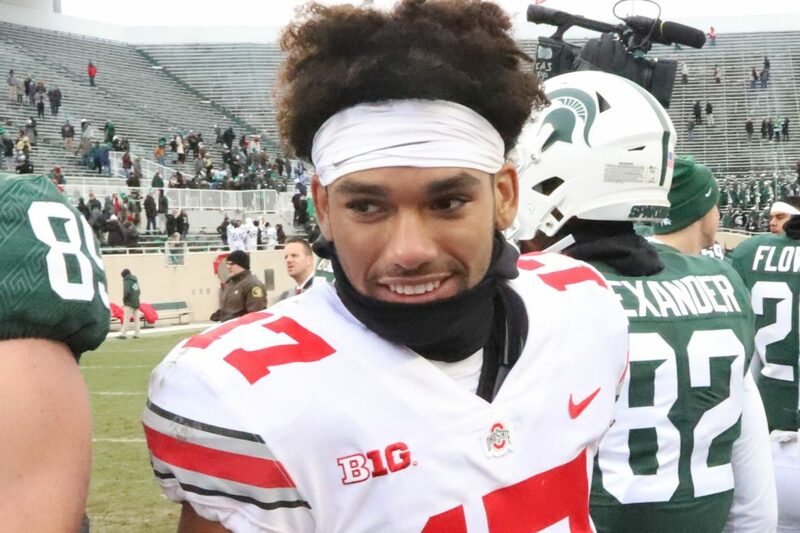 Olave then stepped in for McLaurin, helping out Johnnie Dixon at Z.
Olave responded with a big catch at Michigan State, but then made himself known to every Buckeye fan with two touchdown catches against Michigan and a blocked punt. He followed that up with a 5-catch, 79-yard performance in the Big Ten title game, scoring once. He went without a catch in the Rose Bowl, which is something to keep in mind when setting your expectations for him this coming season. Olave finished with 12 receptions for 197 yards and three touchdowns, playing in every game as a true freshman. 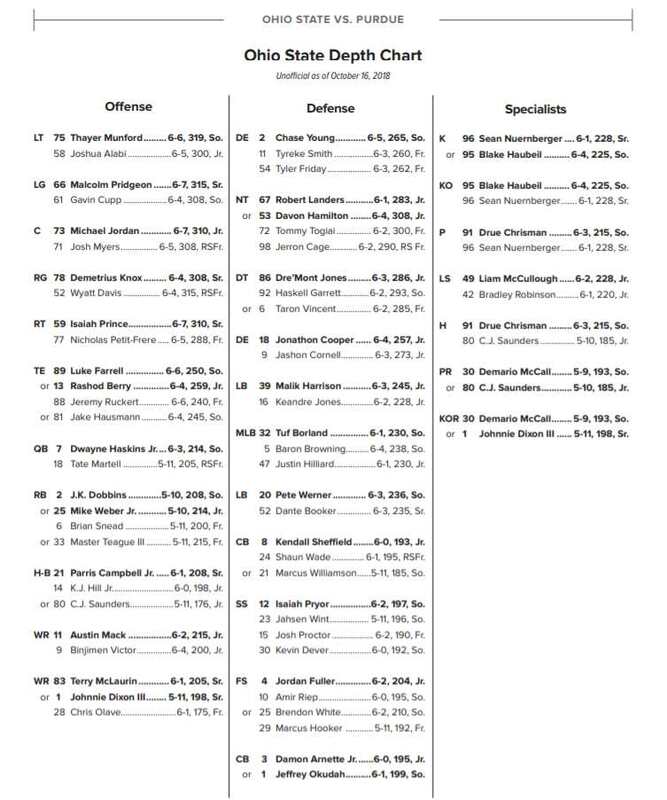 Ohio State will again go with at least two sets of starters this season, and Olave will almost certainly start at Z for the Buckeyes with McLaurin and Dixon now off to the NFL. There will be a competition behind him, but with the experience he gained last year and how comfortable he looked on the field, he should be out there for OSU’s first offensive possession in 2019. But what kind of numbers should we expect? Between the two of them last season, Dixon and McLaurin put up remarkably similar numbers. Dixon went 42-669-8 and McLaurin put up 35-701-11. That comes out to an average of 39 receptions for 685 yards and 10 touchdowns. That’s not a bad place to start for Olave. But we also have to figure in that the Buckeyes may be throwing a little less than they did last season. No matter who wins the starting quarterback job, they will be running the ball a little bit more than Dwayne Haskins did last season. We can also expect the running game to be better overall for a number of reasons. A better running game will lead to bigger runs, which makes the passing game a little less prolific. Still, it’s hard to ignore what Olave did when given an opportunity last season. I think there may be some who expect too much based on a handful of big plays last season, but as long as your expectations stay in line with what McLaurin and Dixon did last year, I don’t think you’ll be disappointed. I expect Devin Smith out of Olave. Very high bar, but what impressed me most was the cut inside of the scUM defender on his 2nd TD This kid has speed and routes but clearly showed savvy as well. If Justin Fields is anywhere near as good at getting Olave the ball as the hype says he is then I think 1st round is possible for this kid. He’s special. Speed kills………Chris Olave’ is probably the fastest guy on the roster. Like KJ Hill he has outstanding hands, so once he’s locked in on his routes and post snap route adjustments, he’s going to be a special receiver. As Parris said last year, Olave hasn’t had a chance to show his speed because all he does is catch TDs. I think Mack and Hill are our mid-range guys, McCall on plays in the flat, Victor is the red zone guy. I think Olave becomes our deep threat guy. He runs good routes, isn’t huge but good at going after the ball in man coverage. What’s more, of the four of them, I think Hill and Mack will require more coverage so Olave should benefit from a lot of man coverage. I think he ends with 20+ yards per catch.